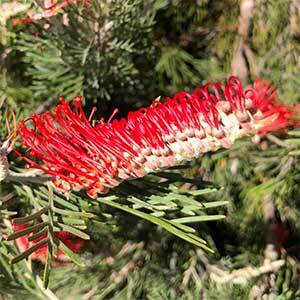 Long flowering and with good green/grey foliage Grevillea Scarlet King is another native plant that attracts birds and bees to the garden. Toothbrush like flowers over a long period make this an excellent choice for the garden border or a native garden design. Propagation is from seed as well as from cuttings. Propagation is easy from seed, grafted varieties are more reliable in the garden. It is important to remove any growth below the graft as soon as it appears. This can be easy snipped off, or even rubbed off with your fingers. Common Name – Grevillea Scarlet King. Height – To around 1 metres plus. Spread – To around .5 metres plus. Foliage – Green to Grey.